Four Staterooms consist of 1 Master, 1 VIP and two twins, each with an additonal pullman. All cabins have ensuite bathrooms. The master stateroom features a large walk around king size bed and a large closet with a built in safe. The master has plenty of storage and a small sitting area comfortable for two. The ensuite features �his and hers� basins and a large walk-in shower. Both twin cabins are fitted with two single beds and one pullman berth plus an ensuite bathroom. Master berth is 2.0 metres in length. / Master is 1.87 meters wide. VIP berth is 1.97 metres in length. / VIP is 1.73 meters wide. Mid Cabin berth’s are 1.95 metres in length. / St’bd Mid Cabin is 2.00 meters wide ( configured as King ). Mid Cabin berth’s are 1.95 metres in length. 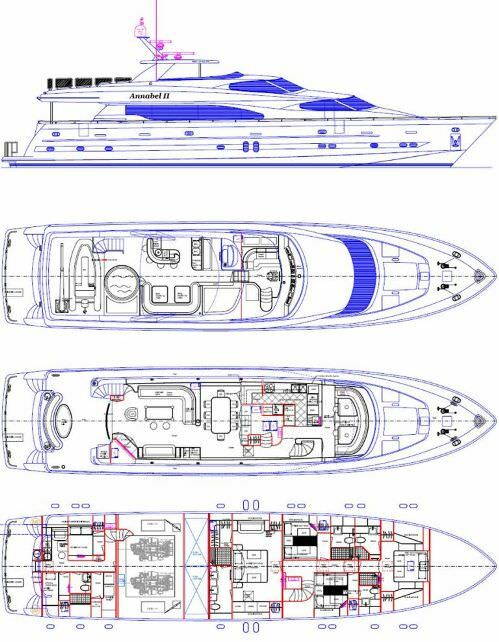 / Port Mid Cabin is 2.09 meters wide ( configured as King ). Thomas has a lifetime of experience on the water and over 15 years in the charter and private sector, spanning from the Mediterranean, to the USA, Caribbean, and Africa. Having performed as captain and first officer, aboard vessels ranging from 22m to 45m, both sail and motor, he brings to M/Y ANNABEL II superior knowledge and understanding of what it takes to run a well-organized yacht, with top notch crew and a first-rate maintenance program. With a vast knowledge of the waters of Croatia and beyond, he will ensure that guests’ experience an itinerary they will cherish for years to come. His go-to and hands-on approach to luxury charters, has Thomas stepping in to assist his crew whenever he can. Licenses include Chief Officer 3000GT, Master 200GT and engineer to name a few. Languages spoken: Italian, English, French, Spanish and Portuguese. Captain Thomas looks forward to a busy season showing guests the beauty of the Adriatic. Savo hails from Montenegro where he has enjoyed working in the marine industry for 10 years, he holds several qualifications including his 100GT yacht license. Having worked his way up through the ranks of the shipping and charter yacht life, he has a good understanding of the requirements to ensure Annabel II is at her best at all times. Savo works well in a team environment and as an individual, with a background in service as a bartender, he is very customer oriented and keen to assist in any way. In his spare time, he can be found keeping fit, playing basketball and fishing. Kerry comes from a long history in hospitality commencing many years ago as an airline stewardess with an Australian carrier which led onto a position in Italy with Air Italia. Kerry has worked as a tour guide throughout Europe managing and co-coordinating up to 55 guests at one time. Kerry then took on the role of Food & Beverage Manager at a large Australian resort before opening ‘Primo E Secondo’ – a fine dining Italian restaurant with her husband Robi in Noosa, Australia. Kerry and Robi successfully ran their restaurant for 8 years before they received an offer too good to refuse and sold the business as a successful ongoing concern. In 2008 Kerry worked on DEBRA ONE, a 74ft Ferretti as sole stewardess and cook. This was a very demanding role but nothing Kerry couldn’t handle, Kerry was one of the first crew ever onboard ANNABEL II when she was first launched in 2009. She has since worked aboard both private and charter yachts, cruising globally, ranging up to 32 meters. Kelly has now returned to Annabel II and the owner is delighted to have her back. Kerry holds her STCW95, a recreational motorboat license, senior first aid, silver service skills, wine service, bar skills a good eye for detail and the ability to work under pressure. Kerry is a non-smoker and when she is not enjoying good food and good company, she enjoys horse riding, gym, swimming, reading and learning about new destinations and people. Kerry speaks English fluently and conversational Italian. Robi is a fully qualified chef who was born and trained in Italy. He has a huge range of experience in restaurants and on yachts. Robi has owned and operated fine dining Italian restaurants in Milan and Noosa, Australia (with his wife Kerry). Their restaurant ‘Primo E Secondo’ was awarded winner of the Italian ‘Golden Fork’ Award. Whilst Robi is capable of preparing a wide range of cuisines including Asian and Japanese, his specialty is modern and classic Italian. Robi’s food is not only tasty but nutritious and he is happy to provide nutritional consultancy for guests and crew. He’s also excellent at working to budgets to maximize your APA dollars! Robi has previously worked on M/Y COHETE 28m and as relief chef on S/Y RAPUTURE 32m and M/Y NEVER ENOUGH, in 2009 he joined ANNABEL II. Over the past few years, he has sailed aboard both private and crewed yachts, he is a welcome return to ANNABEL II. Robi is a non-smoker and holds a STCW95, a recreational motorboat license. Robi is extremely active and loves outdoor pursuits including horse riding, motorbiking, fitness, surfing, scuba diving, snow skiing and parachuting! Robi is fluent in Italian and speaks good conversational English. Tristan returns to ANNABEL II as deckhand and assistant engineer, hailing from South Africa’s Cape Town, he has always had a passion for the sea and therefore naturally has chosen the yachting industry. Having worked on some notable yachts such as the 55m Step One, Highland London and Nassima to name a few, he brings with him a good and complete understanding of luxury charters. Tristan is a motivated individual, always willing to gain further knowledge within the industry and beyond. With his easy-going, yet professional personality, he is happy to pitch in assisting the captain and crew where he is needed, in addition to his role aboard. In his spare time, he stays active with water sports and fitness.